For Immediate Release: Posted On 9/5/2014 By Industrial Magnetics, Inc.
Industrial Magnetics Inc.(IMI) recently announced the formation of a new partnership with Correlated Magnetics Research(CMR) that names IMI as an applications consultancy and manufacturing supplier of Polymagnets® for industrial and consumer goods manufacturing applications. Polymagnets® are multi-pole encoded magnets that contain small magnetic regions called maxels. Polymagnets® can produce superior attachment forces, safer magnets, precision alignment, shear and torque stiffness, and complex, multi-level/multi-force control on a scale that has not been achieved with traditional magnets. 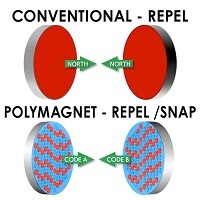 Polymagnet® technology leverages the attraction and repel forces of magnetism, exploiting the idea of controlled cancelation or interaction of these forces in space. The arrangement or pattern of maxels creates a unique magnetic circuit that defines the function of the Polymagnet device and its interaction with other magnets or ferrous metals. This technology greatly expands what is practical, and even what is possible, in magnetics,” states IMI President, Dennis O’Leary. "Through this partnership, IMI is able to expand its offering in advanced magnetics systems for entirely new magnetic applications. The technology includes an expanding library of pre- engineered Polymagnet functions such as magnetic springs, latches or connectors that can self-align to a very tight tolerance. IMI’s CMR Brand Manager, Paul Hardy, explains: "For example, with our Mag Spring products, a pair of magnets is encoded with a pattern that makes them attract at a distance and then repel up close to create a magnetic spring or cushion. Additionally, we have the Twist Latch line, where a pair of magnets is encoded to either repel or attract as their faces are rotated." Polymagnets also offer a significant advantage when used for standard attachment applications. Since their strength is concentrated near the face of the magnet, it not only increases the attachment force to more than double that of a conventional magnet, but it also reduces the risk to magnetically sensitive electronics or the accidental attraction to nearby metal or other magnets. IMI’s new Polymagnet line will be on display at the upcoming Design Engineering Expo(DEX), October 28, 2014 at the Mississauga Convention Center in Ontario. Polymagnet Demonstration kits are also available to purchase on the company’s website, which offer design engineers a range of products for application testing. For more information, pricing and availability of Polymagnets, contact Industrial Magnetics, Inc. at 231.582.3100 or email:phardy@magnetics.com. Correlated Magnetics Research is the inventor of correlated magnetic systems technology for consumer and industrial applications. Polymagnets® is a registered Trademark of Correlated Magnetics. IMI designs and manufactures magnetic products for a wide range of industries, including Automotive, Material Handling, Food, Petrochemical, Mining, Recycling, Appliances, Primary Metals, Plastics, Paper Products and more. With worldwide distribution, including a direct sales force and a dedicated group of channel partners, they provide personalized service and innovative solutions to meet the exact needs of customer applications.